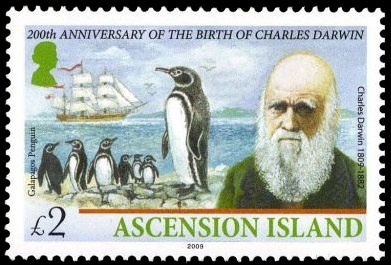 Ascension Island 2009 "200 Anniversary of the birth of Charles Darwin"
Charles Darwin was born in Shrewsbury, Shropshire in February 1809, to a wealthy and well-connected family. He had initially planned to study medicine at Edinburgh University but later switched to Divinity at Cambridge. Best known for his theory of evolution, Darwin was fundamental in discovering how all species of life developed from a central ancestor, changing the way we think about how we came to be as humans. 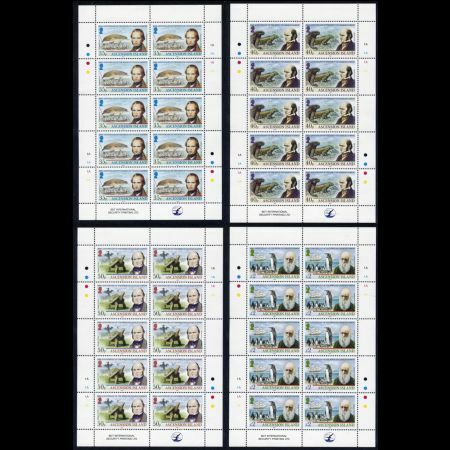 He was a naturalist who searched the globe for new species of flora and fauna and then worked on his theory for 20 years before publishing his most famous work, 'On the Origin of Species by Means of Natural Selection'. 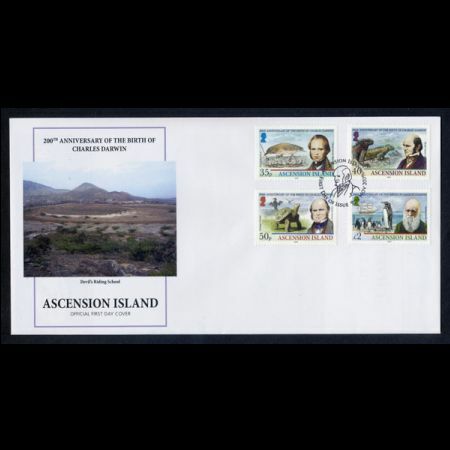 On Ascension it was the geology that interested Darwin, recording his experiences and findings in the third chapter of his ‘Volcanic Islands’. Of particular interest was the Devil’s Riding School, shown on the First Day Cover. Situated on the South Westerly part of Ascension, evidence has revealed that there once was a lake but it dried out and subsided in the centre due to volcanic eruptions. Darwin visited the area and collected samples from a layer of pinkish pumiceous ash, which was full of the siliceous remains of diatoms and 25 other types of plant material; evidence to show the lake had existed. It was later discovered by other geologists that the volcanic ash beds were composed of finely pulverized rock in sub-horizontal bands of white, pink and buff colour, representing successive discrete phases of eruptions. One layer contains the curious concretions called ‘Devil’s Eyeballs’ by islanders, and another containing the abundant remains of organic life. Darwin was fascinated by the area and that’s why it has become a place of Outstanding Natural Beauty and Geological Interest. 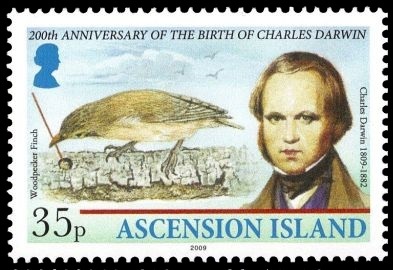 However Darwin’s great breakthrough came when he set foot on the Galapagos Archipelago in 1835. This 5 week visit would eventually change the way we see the world, although he didn’t know it at the time. Comprising of more than 200 islands, islets and outcrops in the Pacific Ocean off the coast of South America, nearly 9,000 species live on and around the Galapagos Islands. An unusually high proportion of these are endemic and some have changed little since prehistoric times. 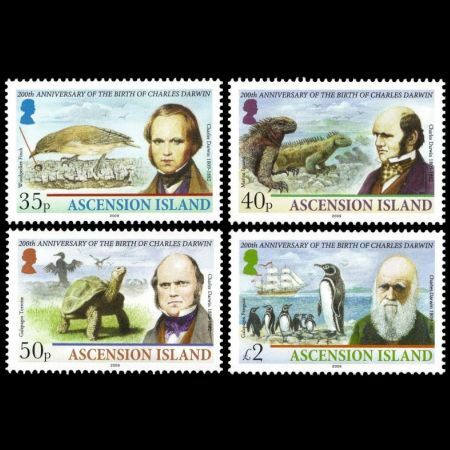 This set from Ascension Island features some of the amazing species that Darwin encountered in the Galapagos Islands and which provided the evidence for his controversial theories of evolution and the foundation of modern biology. 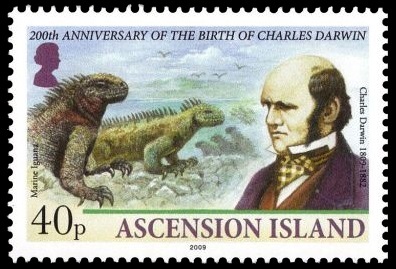 Darwin wrote that ‘the black Lava rocks on the beach are frequented by large most disgusting clumsy Lizards’. These large (3 feet or more) reptiles, which demonstrate the unique evolution and adaption of Galapagos fauna, must have fascinated Darwin who made extensive observations about them. Looking quite fearsome or ‘hideous’ as Darwin put it, they are in fact harmless. It is one of the most unusual creatures in the Galapagos and the only lizard to swim in the ocean. The most recognised symbol of the Galapagos is perhaps the tortoise. 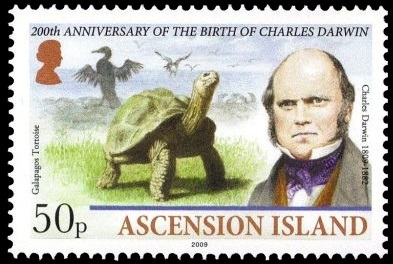 Darwin remarked ‘These animals grow to an immense size .... several so large that it required six or eight men to lift them from the ground.’ Prior to the arrival of man the tortoise had no predators and the largest thrived, a process called Island Gigantism. Known to live for more than 150 years the tortoise played an important role in Darwin’s theory of evolution as he was to learn that tortoises from different islands had noticeably different characteristics. The Galapagos Penguin is endemic to the Galapagos Islands, and the only penguin to live near the Equator. They were brought to the Galapagos by the Humboldt Current, which brings cold waters and nutrients north from Antarctica. The heat is a problem for them. Years with warmer waters from the El Nino Current can see reductions in the small population as it causes a shortfall in the small fish that they eat. To keep themselves cool in the water they will hold out their flippers and on land spread them over their feet to protect them from sunburn.